Why should I worry about online presence? And 50% of Small Businesses Still Don’t Have a Website! I work with small businesses to improve their online presence, search engine ranking, local visibility, and customer loyalty. In other words, I help you attract more customers and retain them. The Helpful Marketer is here to make sure you're giving off the right impression - to customers and Google. 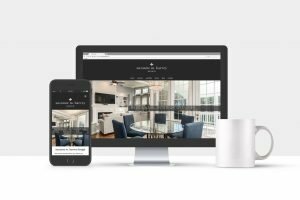 Thoughtful, creative, strategic website design, common sense marketing, a little SEO and some elbow grease goes a long way! 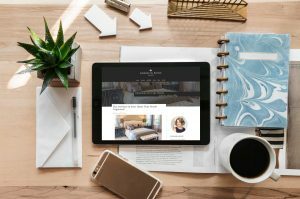 Offering a full range of marketing and website services, I develop custom strategies and practical solutions for each client based on your needs, budget, and technical ability. YOUR BOOK IS BEING JUDGED BY ITS COVER. Consciously or not, consumers are judging you on your website, your ads, brochures... everything. Marketing is part of every interaction a customer has with your business, from discovery to post-sale. Each piece affects a consumer's decision to do business with you, and their decision to come back... and it all starts with your website. 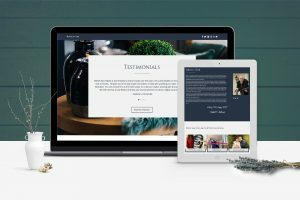 Your website is often your 1st impression, your 1st handshake, your face to the world; it's the #1 representation of your business and the centerpiece of all marketing. If you don't have a website, you're being perceived as less credible and trustworthy. If you have a website that is outdated or looks unprofessional, research suggests perceptions might be even worse! No one passes more judgement on your website than search engines though. Search engines promote websites that are reputable, well-established, and have relevant content because that's what consumers want too. Websites that are slow, old, or not structured properly get pushed down in the ranks, costing you new business opportunities every day. Hi, I’m Abby, and I am “The Helpful Marketer”. I began my career in marketing and website administration nearly a decade ago, founding The Helpful Marketer 7 years later. I'm proud to be a Northeast Ohio native. I grew up in Brunswick, graduated from Baldwin-Wallace in Berea, and moved to Medina. I now have my own little slice of countryside near Lodi, Ohio with my husband and son. This area is home to some of the most beautiful, historic towns in America. Successful local businesses are at the heart of the heartland; the lifeblood keeping these areas alive and thriving. That's why The Helpful Marketer was born. I’m here for small businesses who want to improve their visibility, for new businesses trying to get their name out, and everyone in between. I had the privilege of working with Abby for updating my website. She is such an educated, helpful, and easy to get along with person! As someone that doesn't know much about website building she made things so easy for me to understand. She comes highly recommended from me for all your marketing/website needs! "Abby did incredible work for my church. I have run Facebook ads before, but when she made some ads for me, I had hundreds of people actually looking at my site. I highly recommend her. She is highly talented and very passionate in helping." "Abby was a big help to me when I needed to learn about Facebook. She took the time to work with me and make sure I understood what I needed to help my business page grow. I would highly recommend her if you need help with online marketing."